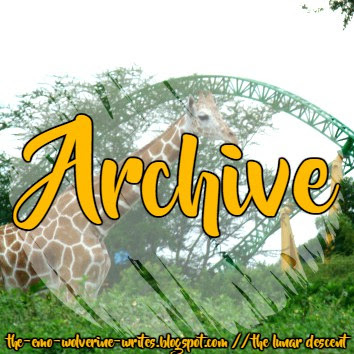 no, I’m not archiving this blog. I was going through my old blog- the old “the emo wolverine writes”. It’s still up, just the URL has been changed. Anyway, I had originally thought about revamping some of the posts there and publishing them here, but I don’t think ‘the emo wolverine writes’ has content that can be revamped and put on ‘The Lunar Descent’. I mean, don’t get me wrong, they’re both my blogs and I really like what I’ve written there. But ‘the emo wolverine writes’ is basically me word vomiting about things that have happened to me. It’s literally a diary- sometimes in the form of pictures, sometimes in the form of narrations and skits. That’s not what The Lunar Descent is, not anymore. I just browsed through some of my own latest posts and I’m not sure how to categorize my blog haha. But anyway, here are a couple of interesting posts worth reading that I dug up from my old blog. Mossi: Oh, I had my bag here. I don’t know where it went. Were you the one with the bomb? I hope you guys enjoy reading those posts! Let me know if you’d like to see more content like that (spammed tumblr textposts and GIFs) instead of the text heavy style I’ve been keeping up on this blog. Anyway, have a nice day!